Its shocking news! This reprinted below. In every country in Europe levies on bank deposits were enacted last night. A 9.9% tax for all bank accounts exceeding 100,000 euros and 6.7% on anything below that. Every business bank account, investment account, savings and ordinary account was included. Herman Van Rompuy, leader of the European council,made a brief statement to journalists. "The Euro crisis is over! The debt is gone. The banks are solvent and Europe is saved!" He said there will be a full ECB statement later today. "there is some possibility, yes." The United Kingdom, though not a member of the Euro currency, also decided to adopt the levy. Chancellor George Osborne explained his decision in an interview to air on ITV's Daybreak tomorrow. "If we did not take this tough and painful decision whilst the rest of Europe did, then we would instantly become the most indebted nation in Europe, if not the entire world. We would be finished. And savings rates have been so poor its better for investors to now have a small percentage of their cash in bank shares, that someday will make a decent profit, rather than keep on whining about low interest rates." "No, I don't think so. Having done it once, people can reasonably expect we will do it again if certain conditions arise and they would therefore be better off spending any money they have on big tellies or smart phones or even a new fleece? The economy is about to receive a big consumer spending boost." "Well they should. It was their idea. The mansion tax would have been an overnight grab of already taxed, built up wealth. A taking by levy. And the polls showed nearly everyone was in favour of it. The problem with that was it wouldn't actually raise much money and was merely a political gesture. But, to take wealth from everyone, well that raises a lot of money. And as its a percentage of accumulated wealth the rich will pay much, much more than the poor. We are all in it together." European Central Bank President Mario Draghi is expected to make a full statement later today. He indicated the move secures Europe and has now made banking union possible through wise government intervention.
" Spaniards and Greeks will do anything, and I mean anything to stay in the Euro. Any level of austerity. Any level of unemployment. Any negative measure of growth. Any instability. Ireland would rather accept 10 years of decline rather than try to live outside of the Euro. And Cyprus? Cypriot citizens did nothing when we took their money away. If people will stand for that, they will stand for anything. Everyone recognises that the Euro is essential for Europe. And everyone wants to be part of it. Whatever the price." A pinch and a punch for the first of the month! Best April Fools since that famous spaghetti tree! PS: Unless of course you have a crystal ball for events at the end of next month. I wonder how many readers will notice the date on the paper? Well, I learn something mew every day. The Freeride Mountain Bike Association is behind the problems the EU has! Andrew: you might have misunderstood the parliamentary tweet language. FMBA means ... Well, the last three words are "my bank account. " or other closely allied activity - indeed some say the group came into existence about the same time as the bicycle was invented. Surely everyone with a balance of over £100k is starting to open up bank accounts for their dog, cat, hamster & chickens. There's some daft nation - Estonia maybe, who still want to join the Euro. Cheers Bill. Non seulement c'est très utile de trouver des comparaison pour ce type des textes très utiles et très important pour le dévoilement de dans divers sujets d'actualité surtout celui ci . 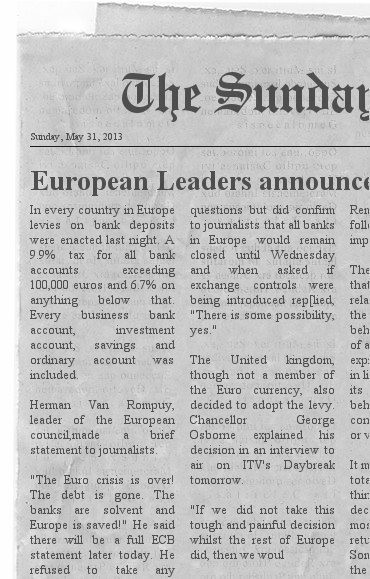 great article really "" In every country in Europe levies on bank deposits were enacted last night. A 9.9% tax for all bank accounts exceeding 100,000 euros and 6.7% on anything below that. "there is some possibility, yes.""" Wellcome to Exkash.com | Cashout E-curreny to Bank Account Directly. It is Very Excelent and nice site. Exkash is honest and automatic cash out service. I am proud for this service. It is very usefull for everybody. The site specifically certified to exchange your E-curreny into bank account directly. you should click this link below to know detail.